It is essential to give your outdoor space the same attention as the inside of your home. You have to tend to your garden, do a bit of cleanup, and blast the dirt and grime off of your driveway. 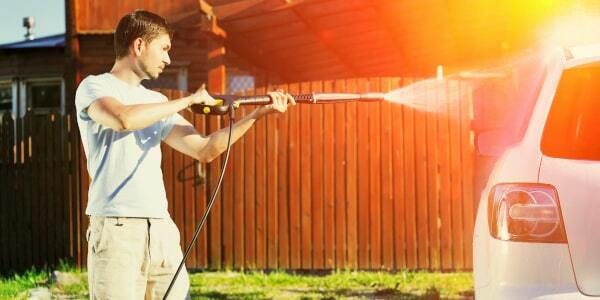 Pressure washers are the ultimate tool for outdoor cleaning. They are efficient and easy to use. You can utilize them for an array of outdoor tasks including cleaning up your driveway, deck, backyard patio, outdoor furniture, vehicles, and even for prepping up your walls for a repaint. It’s the best tool to restore and reinvigorate your belongings that are dirty and worn out. Every pressure washer available out there works the same way regardless of their application, model, price, and size. The main difference here is how they are powered. Electric pressure washer. This type is portable, lightweight, and you need a power outlet to hook it up. Moreover, it is quiet and easy to move around. It’s ideal for your small cleaning projects at home such as sprucing up your patio or washing down your house’s exterior entrance. Read the Cleanup Expert rating of electric models reviews to help you with your purchase. Works best small cleaning jobs. Light, quiet, and low maintenance. Cleaning time may take longer since it uses a lower water pressure. Nozzles and wands are made of plastic. Gas pressure washer This unit is more powerful but limited to its hose length in terms of portability. It can take on much bigger tasks including removing grime from your driveway and exteriors that are challenging to reach. Ideal for cleaning large areas. You don’t need chemicals when using it. Capable of removing tough gunk and grime. On the heavier side, noisy, and needs tuning up from time to time. It may overheat if left idle for a long period of time. Since it’s high-powered, there’s a big chance of splintering wood surfaces or chip paint. Pressure washers are capable of providing a very powerful and concentrated pressure stream of water that can potentially damage your property or even injure you or any passersby. That’s why it is essential to handle any type of pressure washer with utmost caution and to know the pressure washing safety guides to avoid future problems. The power of a pressure washer will determine the types of job it can take. Its pressure power is measured by PSI or pounds per square inch and GPM or gallons per minute. Those with a higher PSI and GPM rate offers a quicker and reliable cleaning. If you want to cover a large area in as little time as possible, go for those with a higher combination. However, these are more expensive compared to units with low power. Light-duty. The rate of this unit is usually from 1300 to 2000 PSI at 2 GPM. its lightweight, compact, and great for tackling smaller jobs like cleaning your patio, grills, and furniture. Medium-duty. These pressure washers are typically powered by gas with a rate ranging from 2000 and 2800 PSI at 2-3 GPM. They are more powerful, sturdier, and great for use at your home or shop for cleaning driveways, fences, and walkways. Heavy-duty. With an output of 2900 and 3000 PSI at 3-4 GPM, these units are perfect for commercial purposes. They are durable and can take on most larger jobs such as removing graffiti off the wall and for stripping paint. Extra heavy-duty. These units can tackle all the jobs of the previous models but with extra power at about 3300 PSI and even higher. There are some features and accessories you need to consider to get the most out of a pressure washer. Majority of pressure washers has a hose with a length of about 25ft. This is enough to provide you with a decent range to clean the sidings and rooftop of your house, and anything areas near your water tap. Spray nozzle. If you want to change the water pressure coming out of your unit as well as the spray’s angle, consider getting different spray nozzles to make it more versatile. These accessories provide additional scrubbing power when cleaning things. Transport wheels. For a more convenient way of moving around your pressure washer, look for those with wheels. Carrying handles. These are very helpful particularly if they’re telescopic. Onboard storage. This is handy for keeping your unit’s nozzles, hoses, and extension cords so that you will not misplace them. Although these machines are powerful enough, there are times when they need the help of detergents mixed in water for cleaning dirt. There are models that come with a detergent tank for this purpose. But always make sure to use only those designed for a particular model or brand. Quick-connect. There are models with this capability that allows you to change nozzles easily. Vertical surfaces should be washed from the bottom upwards and rinsed from the top downwards. The rule of thumb is to use a broad and low-pressure nozzle that will be able to provide you with adequate cleaning. A nozzle that’s too narrow can potentially cut into the surface you are working. Be aware of the colors of the nozzles which indicate the spray pattern’s forcefulness and narrowness. Test the nozzle first in an unobtrusive area before tackling visible areas. Avoid any damage by holding the tip of the nozzle of your pressure washer at a distance and angle over the surface you’re trying to clean. Prevent cutting into surfaces by always moving the pressure washer nozzle. If you’re using a gas-powered unit, it is recommended to add a fuel stabilizer to its gasoline before loading its fuel tank.